**April Voltage live tour**......drums drums drums.....DJ Tyson, Mc Dapper, Mc Donkskey, Niels van Hoorn on Sax/Steiner (The Legendary Pinkdots). Bradly the Jungle Drummer is a much appreciated guest at the FORMS parties, whether he'll be bringing his drums and/or loads of beautiful girls, he gets the place amped. Drummer, producer, and sampel wizzard. Play’s live on stage the european dance and hip hop scene. Voted for the best dance drummer in 98 by the GRP-nl, on tour with: The Longhorn Devlls, The Proov, Lady Bee, Voltage and more. 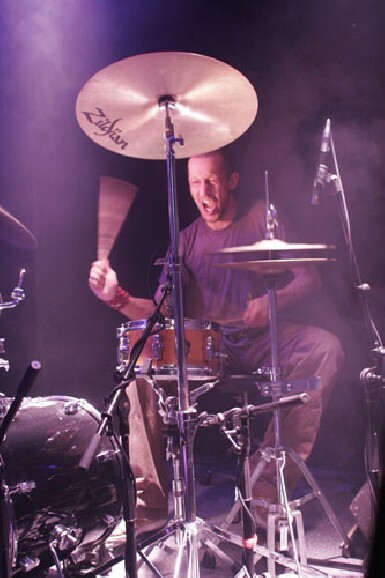 On stage Bradly is a grazy live drummer, people love’s his way of performing, so much energy. Different styles of music, from house till rock, from dance till, jazz, he play’s it all!. Represented festivals like, Dance Valley, North sea jazz, Low-lands, Nature -One (d) and all the big clubs in europe. Together with Dj’s like, Tyson, Dj S-Dub, DJ Smooth Cee; musicians like, Niels van Hoorn (Legendary Pink Dots), Mike Shott, Mark Speybey (Soviet France & DVO)) and much more of the best dj’s and live acts.